Many a metal fabricator enters the precision cutting market banking on plasma- and laser-cutting machines. Each technology has its niche, balanced on factors such as workpiece material type and thickness, part complexity, edge-condition requirements and dimensional tolerances. Those choices become even more complex when deciding between CO2 and fiber lasers, and standard and high-definition plasma. Making sure it uses the right tool (or technology) for the job at hand is exactly why metal fabricator Cupples J&J has one of the longest equipment lists I’ve ever seen. We’re talking 15 laser-cutting machines, 24 press brakes, three CNC punching machines, 17 robotic-welding cells and three stamping presses. And, the list goes on and on, including a fully equipped machine shop and quality department. One of the latest additions to the shop came late in 2012—a waterjet-cutting machine. Cupples J&J operates a pair of manufacturing plants—a 120,000-sq.-ft. main fabrication plant in Jackson, TN, and a 55,000-facility in nearby Dyersburg, TN. With its roots tracing back to the late 1960s, the firm experienced quick and healthy growth throughout the 1970s on a steady diet of work from a nearby Proctor & Gamble factory, cooking up the popular Pringles brand of potato crisps. “They were our original big-time customer,” says Cupples, whose father James Cupples (in 1969) founded and still runs the company. When James moved the company in 1979 to its current location in Jackson, 11 employees toiled in a 12,000-sq.-ft. factory. A steady diet of work manufacturing Pringle-processing and packaging equipment helped to fuel the firm’s appetite for fabricating and machining equipment, “allowing us to grow to a size where we could look at expanding into new markets,” says Cupples. Among those new markets were OEM manufacturers of lawn and garden equipment, tractors and other heavy equipment, as well as steelmaking and processing facilities. 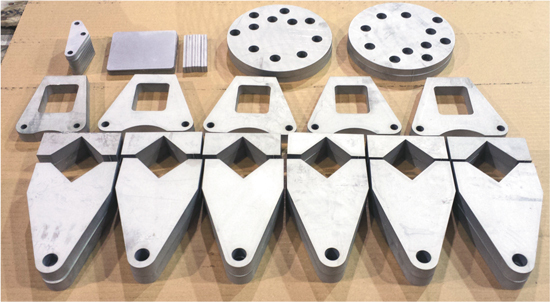 Cupples says that his waterjet-cutting machine is yet another example of having the right tool for the job—the “missing link.” An example of the type of work the machine takes on: these parts waterjet-cut from 5⁄8-in.-thick Type 304 stainless steel, “where edge quality from laser- or plasma-cutting would not be up to the company’s standards,” says Jeff Cupples. And so it went, as the firm picked up a head of steam and kept gaining acceptance as a diversified metal fabricator. Highlighting its laser-cutting resume now are six 6000-W laser-cutting machines—three CO2 machines and three machines equipped with fiber resonators. “Our plan of attack always has been to support our customers by investing in the fabricating equipment needed to outfit their production lines,” says Cupples. The company manufactures products such as food-processing and lawn-and-garden equipment, agricultural products and steel-processing apparatus. To fill that niche and once again “find the right tool for the job,” says Cupples, the firm invested in a dual-head waterjet-cutting machine (a Bystronic ByJet Smart). Since bringing the waterjet machine inhouse, about half of the work on its 5- by 10-ft. cutting table has been projects already being cut inhouse using other, “less efficient processes,” Cupples says, “that now run more productively on the waterjet.” For example, Cupples cites waterjet cutting of aluminum machine frames at twice the speed of machining on a bridge mill. And, for manufacturing machine side frames from 2-in. steel, the ByJet Smart carves the profiles in one step with finished edges, whereas machining the profiles required a two-step milling operation. Work for new customers represents the rest of the waterjet work. “We’re getting a lot of waterjet projects from several of the steel-service companies in the region,” Cupples notes. One interesting waterjet project of note, explains Cupples, is fabricating bar stock from thick plate. Bystronic rates the machine to a positioning accuracy of plus or minus 0.003 in./axis and repeatability of ±0.001 in./axis. Maximum positioning speed is 1100 in./min. (simultaneous x-y axes); the 9-in. Z axis allows a maximum workpiece thickness of 8 in. I like the story about how Cupples J&J started. I think that is a really smart way to grow a business, especially something like a waterjet cutting business, or any other type of fabrication, or manufacturing business. The most important thing is to focus as tightly as possible on what creates profit. Once you create enough profit from that, it is much easier to get into new markets.